"In debate after debate, Democratic and Republican politicians have decried the problem of illegal immigration, called for more border security and employer sanctions, and eagerly searched for evidence that their rivals employed undocumented help. The Obama administration proudly touts the fact that it is deporting more undocumented aliens than George W. Bush, while many of the families they support remain stranded in the United States, and most of whom were guilty of nothing more than the inability to satisfy a nightmarish bureaucracy. "Our government has made it practically impossible for most would-be immigrants to work legally in America, a fact illustrated by this flowchart from Reason Magazine. "For most of American history, immigrants streamed into this country, found jobs, and either stayed to build a life or returned to their native country if they couldn't. America was admired by the world and proudly displayed an ode to immigration on the Statue of Liberty, within sight of the major processing center at Ellis Island. We can and should return to that tradition. "Every significant problem blamed on immigration in this country is either imaginary or caused by government. In Arizona, where illegal immigrants are being blamed for an increase in violent crime, violent crime has actually been declining for a decade, and declining much faster than the national average. Immigrants (both legal and illegal) commit crimes at lower rates than natives. If you're worried about gangs, then end the War on Drugs which funds them, just as it did the gangsters under alcohol prohibition. "Immigrants are often accused of overloading the welfare system. This is again the fault of a government program. But the idea that welfare is a magnet for immigrants is a myth. In an ingeniously designed study by University of Hawaii Professor Ken Schoolland, patterns of migration within the 50 states, which have no travel restrictions between them, were studied. Schoolland found that were was, in fact, a very strong correlation between welfare and immigration: it was strongly negative. All of the states with the highest levels of government welfare benefits experienced net emigration to other states, and all of the states with the lowest levels of welfare experienced net immigration. Arizona, the current focus of anti-immigrant fears, ranks 46th in welfare benefits. "Immigrants come here to work. Anyone who works and produces makes others better off. And unemployment and immigration actually are another two factors with a negative correlation. There has only been one decade in American history in which we did not have net immigration: the 1930s. If that is your idea of a great decade, you can have it. "One unintended side effect of border crackdowns is to increase the number of undocumented aliens who remain because of the difficulty and cost of leaving and returning. Another is to create an 'underground railroad' that makes it easier for terrorists to enter without detection. The overwhelming majority of immigrants would love to come in through the front door. It is our bad immigration policy that has constructed the back door. "It is time we stopped scapegoating the people who represent what is most admired about America. 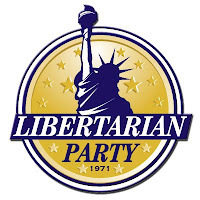 When the Libertarian Party was formed in 1971, we selected the Statue of Liberty as our symbol. We're the only political party that deserves it." "We support the removal of governmental impediments to free trade. Political freedom and escape from tyranny demand that individuals not be unreasonably constrained by government in the crossing of political boundaries. Economic freedom demands the unrestricted movement of human as well as financial capital across national borders. However, we support control over the entry into our country of foreign nationals who pose a credible threat to security, health or property." 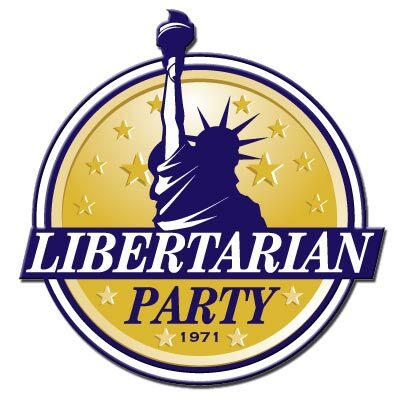 The Libertarian Party platform is available in Spanish. Cheekwood's 11th Annual Day of the Dead fall festival is this Saturday. Can you believe it's been 11 years? What a tradition! Come celebrate with us at our 11th annual Fall Family Day, El Día de los Muertos. In recognition of this Latin American holiday, Cheekwood will bring the traditions of Mexico to Nashville. We’ll celebrate with traditional music and dance, vibrant art activities and authentic Mexican food. Learn about the culture of our Latin American neighbors as you explore the beautiful altar displays, shop in the bustling Mexican marketplace, and enjoy the fine cuisine from local bakeries and restaurants. 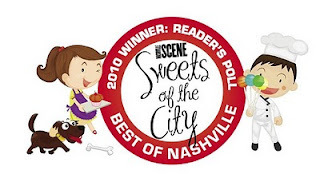 Call 615-353-9827 or email hsteinwinder@cheekwood.org. Take part in the Mexican art of paper cutting. Honor your family in a copper-relief journal. Add your thoughts to the colorful tree of memories. Create a custom tombstone to honor your lost pets. Make a colorful skeleton mask to wear in the parade. Create a colorful kite like those flown in Guatemala on the Day of the Dead. A Día de los Muertos tradition! Decorate a sugar skull to honor your ancestors. A fun and interactive way to practice your Spanish and learn more about the holiday! Be inspired by legendary Mexican printmaker Jose Posada. Draw and print your own design! Colorful open air markets line the streets of Mexico during the celebration. Local merchants sell food, flowers, art, and handmade items which people buy to decorate their altars and tombs. Visit the vendors at the festival to discover the talent of local artists, shop for unique gift items, and taste traditional foods! 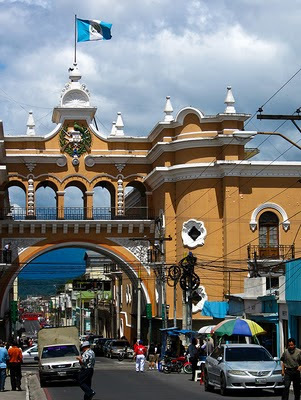 Photo of Guatemala City by Ben Beiske. Licensed via Creative Commons. “Urban-mestizo language and culture as the “zero degree” of Southern Quechua: Ethnographic, archaeological, and political implications”; Lecture by Bruce Manneheim (University of Michigan) 4:10pm; 101 Garland Hall. Sponsored by CLAS and the department of Anthropology. 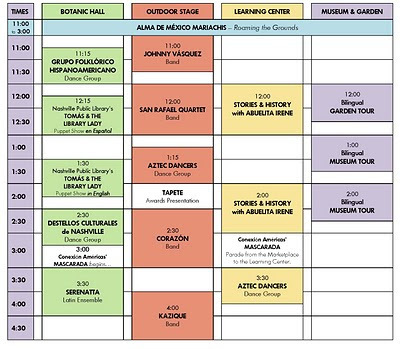 “Models for Healthcare & Development: Lessons Learned from Guatemala”; 2pm-5pm; First Amendment Center. Click here for more information. “Challenges to Development in Guatemala”: Lecture by Guatemalan Ambassador Francisco Villagrán; 5:30pm; First Amendment Center. Click here for more information. 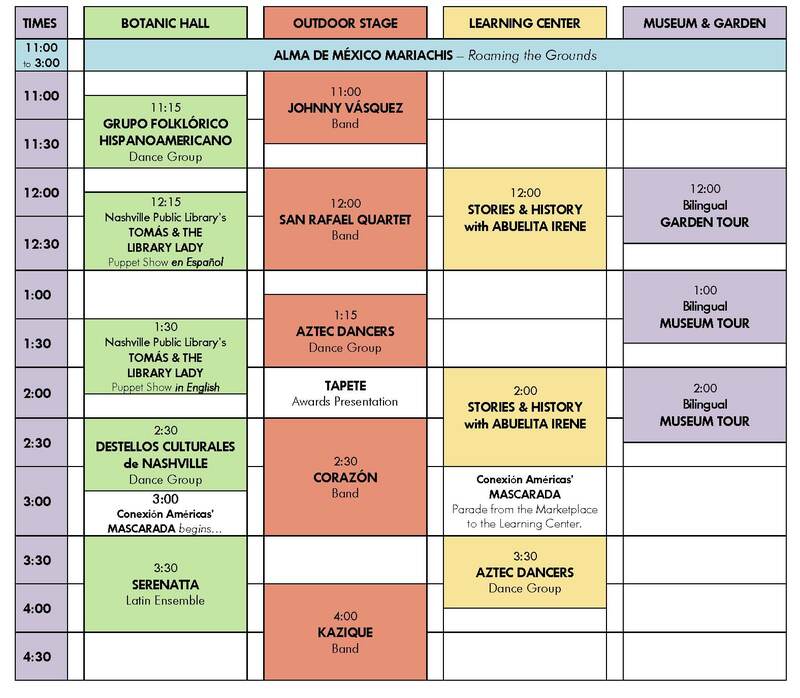 Día de los Muertos Festival; 11am-5pm; Cheekwood Museum and Botanical Gardens. More info here. TIRRC's 8th Annual Membership Convention will be held November 13 at 9am. Annabelle Cruz at Family & Children’s Service is hiring a Family Advocate and a Bilingual Information and Referral Specialist. Metro Police's El Protector program's September newsletter is here. Officers Rafael Fernandez and Gilbert Ramirez are the listed contacts. Photo by Todd Sanders. Licensed via Creative Commons. Today is the seventh anniversary of HispanicNashville.com! As I said this time last year on the site's sixth anniversary, HispanicNashville.com is really a celebration of you - your stories, your friends, your lives, your loves. It's about getting to know Hispanic Nashvillians better. I'm getting more deliberate about denouncing the "i" word (click here for my stories on this subject on HispanicNashville.com, or here and here for what I wrote on the HeartSwitch framing blog). Mack has always been worth paying attention to, either on his blog Coyote Chronicles or on his guest posts on this site. We get to hear not only his story but also the stories of his amazing family. So I gave Mack an entire page on this site, which is the HispanicNashville.com equivalent of a star on the Walk of Fame. Occasionally, I do some original reporting and tell you what you haven't heard about elsewhere: how Hilario Razura came to town, what Miss Tennessee Latina thought about the national pageant, the fact that the newspapers published an unsigned copy of a report supposedly filed to report immigration violations at the Music City Center construction site, a local Latino rap/hip-hop compilation, the Peruvian history of a Peruvian-American CEO, the first Latina in the Tennessee legislature - stuff like that. 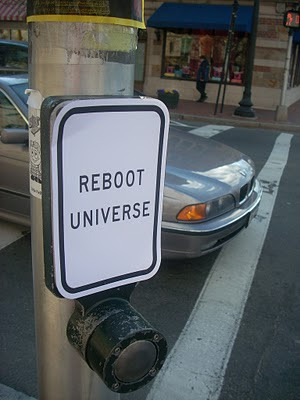 This reboot principle has to be brought over to immigration law. Dedicated youth like Oscar who have no individual culpability for the fact that they don't have a visa deserve at least one chance to earn legal status. "You don't have the right to mention my laws"
Like I said, these are your - our - stories. 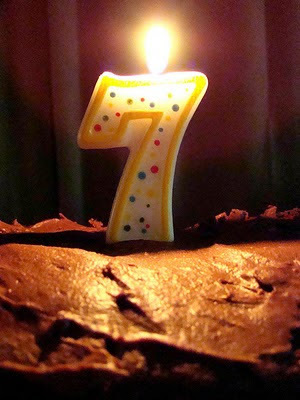 Happy 7th Birthday to all of us. 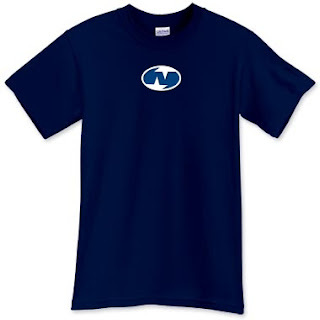 One last thing: this year was the year I came up with, "In the South, We Are All Related" as a tag line for the site, so I couldn't help putting it on some anniversary swag over at CafePress and Printfection. I'll be giving some of this stuff away, so keep your eyes posted here, on the @muybna Twitter feed, and on the HispanicNashville.com Facebook page. Who said you wouldn't get gifts at this birthday party? Raul Malo introduces fans to world of "Sinners and Saints"
Photo by Ryan Laughlin. Licensed via Creative Commons. If you haven't read my August 10 post about immigration bankruptcy and the reboot gap, check that out here. A commenter named Callie got me thinking, and I made some revisions to the original post. I think this immigration bankruptcy idea has legs, so even if you've already read the story, share it with a friend. Also, FYI - HispanicNashville.com turns 7 on Thursday. Any ideas about how to celebrate? 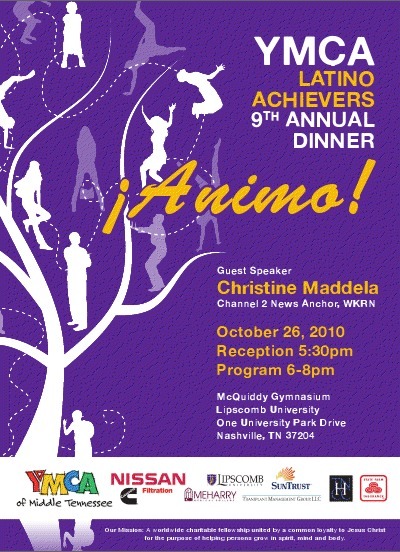 The 9th Annual YMCA Latino Achievers dinner will be held October 26. Christine Maddela will speak. RSVP by October 21 at latinoachievers@ymcamidtn.org or 615-743-6206. 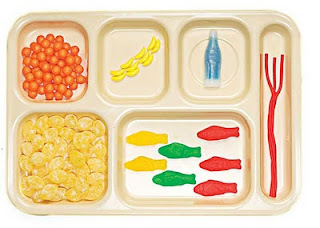 The fee of $50.00 per person covers your meal as well as a meal for a family in the program. from YMCA of Middle Tennessee on Vimeo. Update: The museum's arrival in Nashville has been delayed due to mechanical issues. Tuesday is the earliest it will arrive. More details at the Tennessean. A variety of Nashville groups have brought the Modern-Day Slavery Museum to Nashville this weekend, starting with a showing at Second Presbyterian Church today and moving to other sites Saturday and Sunday. The museum offers an interactive accounting of current cases of U.S. slavery in this decade, using a replica of a truck where tomato pickers where chained up at night. Nashville has at least twice been the site of modern-day slavery arrests. In 2005, the Jersey Journal and the AP reported on a woman found here who was alleged to be part of a ring that held 13 adult women and 6 juvenile women captive, all from Honduras. In 2008, WTVF reported on two men charged with holding a 22-year-old Mexico City woman captive for sexual servitude. The free museum operates out of a replica of a cargo truck where Florida tomato pickers were nightly chained, in circumstances which a 2008 grand jury described as “slavery, plain and simple.” The Museum's exhibits, developed in consultation with workers who have escaped from forced labor operations as well as leading academic authorities on slavery and labor history, focus on the roots of modern-day slavery, the reasons it persists, and solutions. The Museum is part of an educational campaign created by the Coalition of Immokalee Workers, www.ciw-online.org, a group of migrant farmworkers who help investigate and prosecute slavery cases in Florida's fields, and also work for improved conditions for agricultural laborers. Under the slogan that "Consciousness + Commitment = Change," the CIW has achieved unprecedented concessions from the corporate food industry, with giants like McDonalds and Taco Bell signing agreements with them to monitor conditions in the fields they buy from and pay workers directly a penny for each pound of tomatoes. Their current campaign targets Publix Super Markets, which until now has refused to come to an agreement with CIW members. Nashville's Civil Rights heritage will be remembered in a resolution presented to City Council on October 19th which welcomes the museum to Nashville and condemns modern slavery of any form. The Museum hits Nashville just months after a local scandal in which H-2B guestworkers were allegedly held in forced labor conditions. Nashville Food Sovereignty is a coalition working to identify and eliminate the root causes of injustices that lead to hunger and poverty in the world, and move toward democratically-produced food systems at home and globally. The Vanderbilt Campaign for Fair Food is a student-led organization aiming to partner with administrators to shift institutional food sourcing towards fair, local, and organic options. The Workers' Dignity Project is a volunteer-run project which educates low-wage workers about their labor rights and provides support for direct action against wage theft. 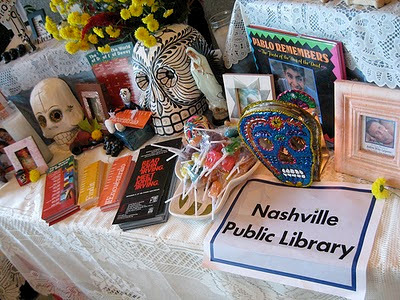 The Tennessee Immigrant and Refugee Rights Coalition (TIRRC) and the Nashville Area Hispanic Chamber of Commerce* (NAHCC) will be holding back-to-back awards ceremonies tomorrow afternoon and evening. TIRRC will hold its American Dream Awards Ceremony from 4:30-6 p.m. at Belmont University, and NAHCC will hold its 2010 Hispanic Heritage Month Business & Community Awards from 6-8 p.m. at the Tennessee State Museum. * Mr. Bill Sinclair, Executive Director of Catholic Charities of Tennessee will receive the Welcoming Tennessee Award, recognizing outstanding leadership in promoting a more welcoming and inclusive state for all of us. This award honors a community leader who looks beyond superficial differences and recognizes that like new threads in a quilt, immigrants and refugees strengthen the fabric of our communities. * Mr. Tommy Vallejos, Montgomery County Commissioner will receive the Johnny Hayes American Dream Award, recognizing outstanding leadership in removing barriers to the full civic participation of new immigrants and refugees. This award honors a community leader who recognizes that all residents who work hard and contribute to the community have an important role to play in our collective future, thereby helping make the American dream a reality. Tickets are not required, but please confirm your attendance by clicking here. If you have any questions, don't hesitate to call or email Lindsey Harris (615-833-0384 x102, Lindsey@tnimmigrant.org). 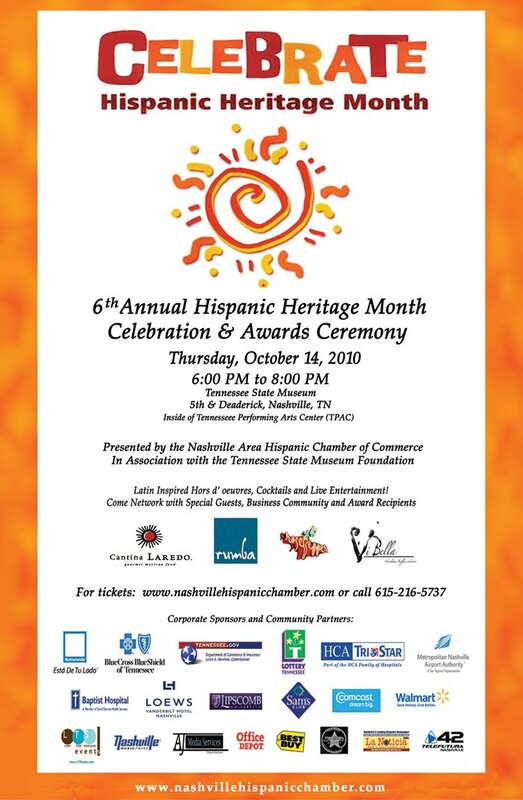 The event presented by the Nashville Area Hispanic Chamber of Commerce in association with the Tennessee State Museum Foundation is open to the public and will feature live music, Latin inspired Hors d'oeuvres, beverages, special guests, and business & community awards. Speakers include U.S Congressman Jim Cooper, Clarksville Commissioner Tommy Vallejos, NAHCC Chairman Luis Bustillos and Hispanic Chamber of Commerce of East TN chairman Angel Martinez. A highlight of the event's agenda will include the unveiling of the collective art work from Nashville's Glendale Spanish Immersion Elementary second grade class of 52 children with the help and guidance of the school's art specialist Cathy Barnett and Principal Sue Clark. Under the theme "Heritage", the project presented by the NAHCC to the school in commemoration of Hispanic Heritage Month intends to instill cultural sensitiveness and awareness. Glendale's mission is to prepare students to become life-long learners and responsible citizens. Through an emphasis on Spanish language and culture, students will meet and exceed academic standards, celebrate diversity, and become productive and responsible members of our global society. During Hispanic Heritage Month (Sept 15 - Oct 15) the NAHCC recognizes the professional, civic and business contributions of its members while also recognizing non-members whose involvement has had a meaningful impact on the community at large throughout the year. Nominees are selected from among those who have demonstrated commitment and leadership to the advancement of the organization, the Hispanic community, and the city of Nashville. Last Friday, ALIAS held its Fall Concert featuring the World Premiere of Hilos, by composer Gabriela Lena Frank. 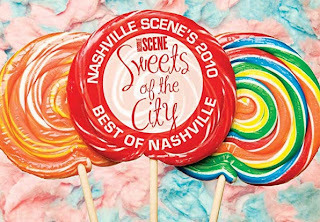 The event was featured on the cover of the Nashville Scene's recent fall guide, where readers learned that Friday's performance was a big-deal collaboration between major educational and governmental institutions, with a tie-in educational component for Paragon Mills Elementary School in Nashville (read more about that at the NEA interview with the composer, here). In partnership with Vanderbilt and St. Paul, Minn.'s world-renowned Schubert Club, Alias has commissioned a quartet by internationally acclaimed composer Gabriela Lena Frank. A young, vibrant composer of Peruvian/Jewish/Chinese/Lithuanian descent (yes, you read that right), Frank is on the cutting edge of modern classical music, creating works that reflect all of those cultural roots, not to mention her extensive travels through South America. In addition to live performances, the project will include a Naxos recording of Alias playing Frank's composition along with the recording premieres of several other pieces. The Spanish word for "threads," Hilos alludes to the image of Andean weaving as a unifying metaphor for the work, but it might well also refer to the many-stranded nature of the project itself. 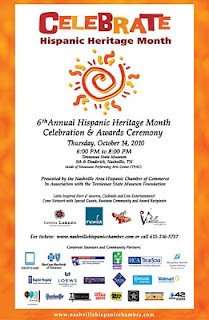 The multiple sponsors have supported not only the commission, concerts and recording, but also a significant community outreach initiative: "Mestiza Music in Music City," which coincides with National Hispanic Heritage Month, will feature several performances at area schools and a family-oriented concert at 4 p.m. Oct. 3 at Antioch High School. ALIAS Chamber Ensemble can do more than make good music: It can, for a time, alter the season and time of day. Frank certainly couldn't have hoped for a better performance. An accomplished pianist, she joined Alias musicians Zeneba Bowers, violin, Lee Levine, clarinet, and Matt Walker, cello, in a rendition that was both spontaneous and intensely musical. Frank tossed off the work's bold tremolos and glissandi with dramatic flair, making the music sparkle. But she was also a sensitive accompanist whose flexible phrasing always brought out the best in the other players. Bowers, Alias' artistic director, proved to be a serious and stylish artist. 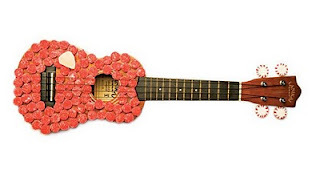 Her golden tone made Frank's highly emotional melodies seemingly melt, and her perfect intonation allowed her to hit every note dead center — no mean feat given that many of "Hilos' " special effects (quick slides and pizzicatos) turned notes into moving targets. Levine delivered some of the evening's most memorable performances. Her playful melodies in the opening movement, "Canto del Altiplano" (Song of the Highlands), readily called to mind the sound of traditional panpipes and flutes. She added colorful counterpoint in the next movement, "Zapatos de Chincha" (Shoes of Chincha). Walker, Alias' executive director, also gave an impressive performance. He played with an amber tone and a solid technique — his playing of fast passages in the fourth movement "Danza de los Diablos" (Devil Dance) had real fire. But he was also a team player whose careful listening resulted in a beautifully synchronized performance. Alias has recorded "Hilos" for an all-Frank album due for release on the Naxos label in 2011. If the recorded rendition is half as good as the live performance, it will surely be regarded as definitive. Nashville will certainly be looking forward to that album. Photo by Eduardo Amorim. Licensed via Creative Commons. 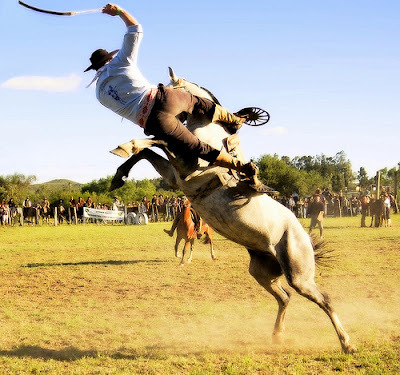 I just got back from a trip to South America, and no, I wasn't on horseback in Brazil, but I did have business there.